Why be ordinary when you can be extraordinary? Hearthstone Kitchen & Cellar is a Summerlin restaurant unlike any other, offering a unique dining experience in a comfortable, impeccably thought out space. What Makes Hearthstone the Best Summerlin Restaurant? A crowd-pleasing yet sophisticated menu. All too often, the pursuit of a crowd pleasing eatery results in groups choosing bland chain restaurants. Hearthstone Kitchen and Cellar is the perfect antidote, striking the perfect balance between sophistication and crowd pleasing options in a unique, rustic-chic space. Our eclectic menu has something for everyone. Seriously! Foodies love the always-creative spin on classic dishes at Hearthstone, like our Shaved Brussel Sprout “Caesar”, which is served with an addictive creamy Caesar dressing and parmesan. Pizza lovers will find something to love on our roster of wood-fire creations, including the beloved Abe Froman pie, made with garlic sausage, mozzarella, onions, and chili flakes. 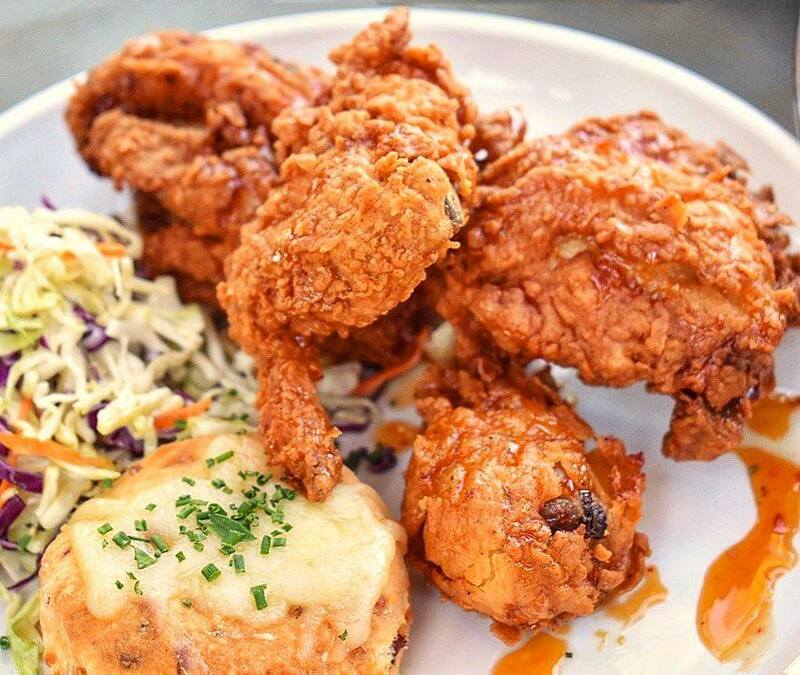 Comfort food fans will find their bliss with dishes like our Fried Chicken, which is served up with a bacon cheddar biscuit, apple cabbage slaw, and spiced agave nectar. Even vegans will rejoice thanks to our vegan menu, including delicious options like Zucchini Ribbons Pesto, made with cherry tomatoes, garlic, pine nuts, and basil. Let’s be real: dinner isn’t as much fun without drinks. At Hearthstone, we have an incredibly robust and creative drinks menu that is bound to dazzle your senses. Cocktail, anyone? You’re going to love our signature cocktails, including the Red Rock Sunset (made with Absolut Elyx Vodka, Aperol, orgeat, stiegl grapefruit, and Scrappy’s Grapefruit Bitters) and The Babymaker (made with Avion Silver Tequila, fresh carrot juice, habanero, lemon, and a tajin rim). We also have an impressive wine list with sparkling, white, red, and rose wines available by the glass and by the bottle. We haven’t forgotten you, beer drinkers! We have plenty of beers on draft and by the bottle and can. Liquor, mixed drinks, and non-alcoholic options are also available! No matter what your drink of choice may be, we’ve got the perfect pick for you. Legendary brunch. Is brunch the happiest meal of the week? The answer is definitely yes if it’s enjoyed at Hearthstone. Our brunch game is strong from start to finish! Kick off a leisurely brunch with a Warm Cinnamon Sticky Bun for the table–though when you take your first taste of the addictive cream cheese frosting it’s served with, you might not want to share! Continue on with sweet and savory breakfast options like Donut Bread Pudding French Toast (yes, it’s just as mind blowing as it sounds) or Eggs Benedict, or opt for more lunch-friendly fare like salads, sandwiches, or one of our delicious pizzas. Don’t forget to order up some Bottomless Mimosas or a Bloody Mary Tableside cart too! Sports fan? Oh good, because we are too. Hearthstone is the perfect spot to enjoy the game day action in style! 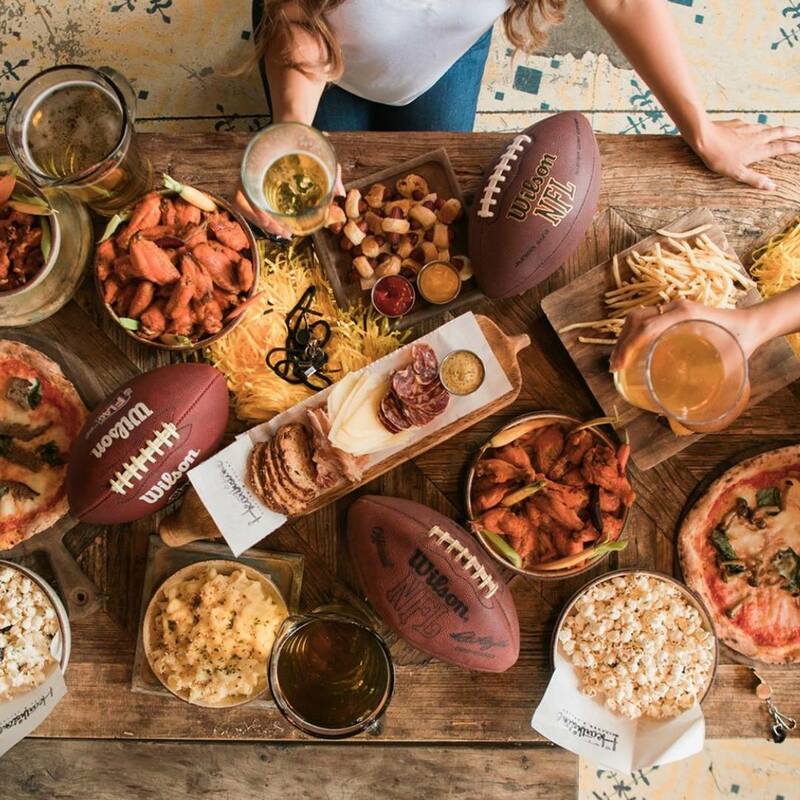 We’ve got plenty of big screens to catch all the action, and frequently offer food and drink specials during game times as well (be sure to check our Events page to stay updated). No matter what season it is, we’ve got the game on. We feature not only the weekly games, but the big events too, from March Madness to the World Series to the Super Bowl and everything in between! 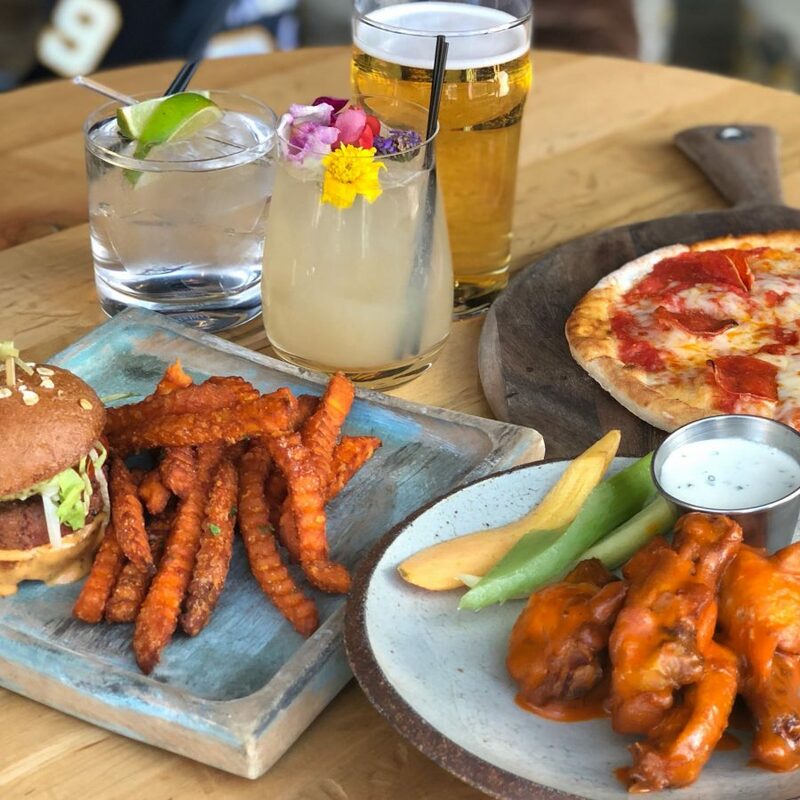 At Hearthstone, we believe in the healing powers of happy hour, and we offer what we humbly submit might be the best one in town. From 5-7pm Monday through Friday, we offer incredible deals on food and drink. Food-wise, we have plenty of tempting options, including our elegant Baked Ricotta Toast made with truffle honey and chives, a lovely Harvest Quinoa Salad made with chickpeas, apple, gouda, and roasted pumpkin seeds, and Crispy Sweet Potato Fries, served with an addictive harissa yogurt dipping sauce. We also have wines on tap, specialty cocktails, well drinks, and draft beer available. Best of all? Every item on our happy hour menu is just $7! Enjoy half price bottles of select wines every Monday! For just $24, you’ll be treated to a traditional taco plate and all you can drink tequila and margaritas! Every Wednesday, oysters are just a buck a shuck! 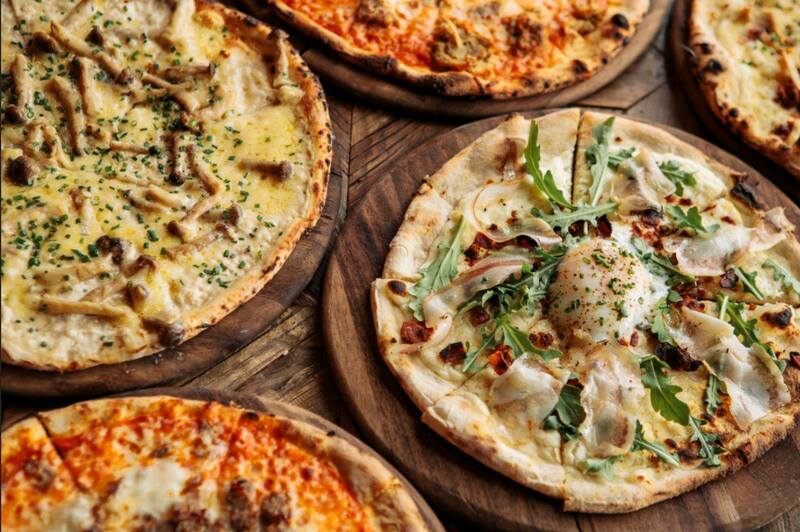 On Sundays from 5-10pm, pizzas are 50% off. That’s a nice way to score a slice! For more information on these specials, visit our Events page. Las Vegas isn’t necessarily known for being a kid-friendly town, but at Hearthstone, we invite you to bring the entire family. We offer a special kid’s menu, frequently host kid-friendly events such as seasonal brunch events, and as part of our Pizza Sunday promotion, we offer a complimentary hour at Kid’s Quest when you buy 3 pizzas. Conclusion: Hearthstone Kitchen & Cellar is a crowd-pleasing restaurant in Summerlin with good reason. Our attention to detail in all of our offerings, from food to drink to decor, service, and more separates us from other restaurants and helps us offer our valued customers a dining experience unlike any other. We hope to see you soon! What’s your favorite thing about Hearthstone?